EDMOND—Each Sunday, members of a local Southern Baptist congregation can be heard saying, “We are a family of faith, passionately connecting to Christ, His church, His Word and His mission for His glory.” These words mark the mission statement for Edmond, First. Not only do members of the church recite its mission statement each Sunday, but Pastor Blake Gideon also strives to lead his church into living out this mission statement. It was this statement that led to an unusual approach to Edmond, First’s Vacation Bible School (VBS). 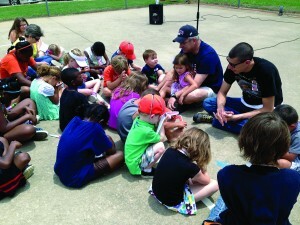 Gideon and Associate Pastor and Children’s Minister Charles Scheffe created a plan to put this mission statement into action by recreating the church’s VBS by going into neighborhood parks for one day and ministering to the families there. 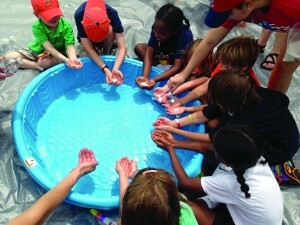 Scheffe explained that the one-day VBS sites were only a springboard for front yard Bible clubs, which came from new LifeWay material for backyard Bible clubs. Each neighborhood park was strategically picked where a member of the church resided. Their home was the meeting place of the front yard Bible clubs. By utilizing the VBS materials and inviting each neighbor to join in the fun, the families were able to receive information about the front yard Bible clubs as well as meet the host home family. Each VBS location had team leaders hand chosen by Scheffe to oversee their site. They were in charge of recruiting other church members to help as workers as well as building relationships with the families at each park. The theme centered around material from Cokesbury called Everywhere Fun Fair, which allowed the kids to learn about many different countries at each station. 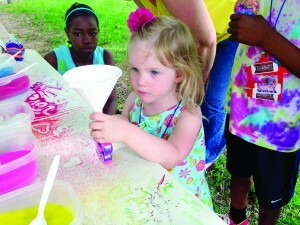 The events were scheduled from 10 a.m. until 2 p.m. and included several missions activities, craft times, recreation and Bible stories. Each site also provided lunch for the families at the park. During the front yard Bible clubs, each group used the Colossal Coaster World material from LifeWay to accomplish four things: a time of recreation, craft, snack and a Bible story. “We took an hour, to an-hour-and-a-half-long approach for five days with the front yard Bible clubs,” Scheffe said. “We left it up to the club ‘team leader’ as to how the group met, when they met and the time frame that they met. After further evaluation, Scheffe is pleased with the results of the one-day VBS and the front yard Bible clubs. The front yard Bible clubs exceeded the original vision. Treating the front yard Bible clubs as they would a new Sunday School class, Scheffe expected to have 10 kids at each Bible club. However, the current average has been upwards of 15 and 16 kids per sites, while some groups had 20 or more on a given night. “One of the big differences between a traditional Vacation Bible School and what we did with this effort was that it was more relational and it felt less programmed,” Scheffe said. “As a result, we have built better relationships with those we came into contact with who are prospects for our church. We also discovered lots of unchurched families in the process. Edmond, First has already seen several families meet the goal of connecting them back to the church and expects more relationships to grow because of this mission opportunity. “Follow up plans are a key thing now,” Scheffe said. “All the families who participated in the One-Days got an invitation to the local front yard Bible club meeting in their neighborhood. They also received a thank you note card written by either the team leaders who were there, or my team that is a part of the Children’s ministry at Edmond.